A portable instrument that enables you to troubleshoot electronic equipment in a powered down state. Simply place the leads across a component and the meter will display a graph allowing you to identify the type and range of each component tested. A helpful capture feature allows you to quickly compare the current component in test to a like component that was previously tested. Why is Talon-Curve superior to standard multi-meters? A Multi-Meters measures the static value of an isolated component. The Talon-Curve meter tests the function of a component while still in-circuit. 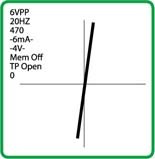 When testing a resistor, the standard multi-meter puts a single current value through the component while measuring the voltage, calculating the resistance, and displaying the value. If the resistor is in-circuit the multi-meter test current is affected by other components such as capacitors and diodes. 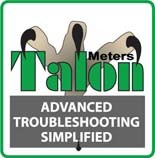 The Talon-Curve meter applies a continually changing current. 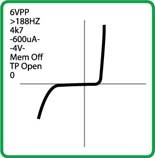 Since a resistor is linear, every increase in current should produce an increase in voltage resulting in a straight line on the graph display. 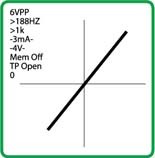 If a capacitor is bleeding off some of the current, simply change the frequency (or speed) of the signal to bring out the linear nature of the resistor. When testing a capacitor, the standard multi-meter determines the capacitor's value by measuring the time it takes to charge or discharge it to a certain voltage. While in-circuit, a parallel resistance consumes some of that current, and the extra time needed is assumed to be a larger capacitor. The Talon-Curve meter takes advantage of the capacitor needing time to charge up to a given voltage; the constantly changing current and voltage displays on the screen as a circle. The Talon-Curve meter can automatically adjust the source resistance and frequency to simplify the range finding process. 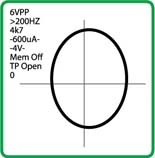 Testing for inductors is performed similarly and will feature the same circle profile. When testing a diode, the standard multi-meter puts a single current value through the component producing a single voltage reading. The probes then have to be moved to opposite sides of the part for a second reading. The Talon-Curve meter shows the corresponding voltage for each current reading without having to move the probes in a quick display graph. If the component is working properly, the typical reverse "L" shape is seen. The Talon-Curve meter can even confirm zener diodes working properly, which is beyond the range of a standard multi-meter. 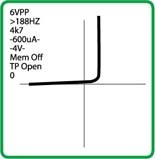 The Talon-Curve meter is great at showing the function of parts in-circuit. An excellent example is a diode in parallel with an inductor as often found in relays; the diode acts as a protective feature to provide a safe place for the inductor current to flow after the power is disconnected to the relay. 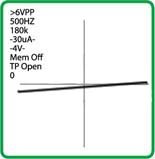 A standard multi-meter cannot see the diode because the parallel inductor reads as a short, thus the diode must be removed from the circuit before it can be tested. The Talon-Curve meter displays the graph of the inductor only (Circle) if the diode is open, a short (vertical line) if the diode is shorted, only a diode (reverse "L") if the coil is bad, and a combination graph of a working diode and inductor if everything is working properly. All of this with only a single probe pair connection and without having to remove any components from the circuit. Only $999.00 - discounts available for multiple unit orders. Interested in becoming a distributor of this product? - Contact us today!